Allen Edmonds is an American shoe brand specializing in premium handcradfted footwear for men. "A classic American heritage brand!" I own several pairs of Allen Edmonds shoes and they've never let me down. Allen Edmonds Shoes Reviewed by Paul Anthony on June 8th . Elbert Allen was born in Tennessee in the late nineteenth century. In his twenties, he moved to Texas to manage a shoe making program in a state prison. After learning the ins and outs of shoemaking over four years and generating ideas for a shoe that needed no breaking in, he moved to Milwaukee to manage the Ogden Shoe Company. He teamed up with Ralph Spiegel and founded the Allen-Spiegel Shoe Company. They began making men’s footwear in a three-story building in Belgium, Wisconsin in 1922. Twenty-four years later, Elbert Allen passed away and his sons took over the management of his firm and brought on a new partner: William Edmonds. Thus, the Allen-Edmonds Shoe Corporation was born. They are still proudly crafting footwear thatr’s made in the U.S.A. The brand is currently headquartered in Port Washington, Wisconsin. Though known for their shoes, the brand also makes a line of leather goods such as belts, wallets, and bags. They also make a curated selection of ready-to-wear clothing. Allen Edmonds has a loyal following. They provided the United States Army and Navy with shoes during the Second World War, and the men returning home from the front continued to wear these shoes for the rest of their lives. Presidents Reagan, H.W. Bush, Clinton, and Bush all wore Park Avenues to their inaugurations. Though they have moved a few aspects of their production to the Dominican Republic, the company has largely resisted a footwear industry-wide trend of moving all of its operations overseas to developing countries. They have done this mostly out of concerns over quality control. 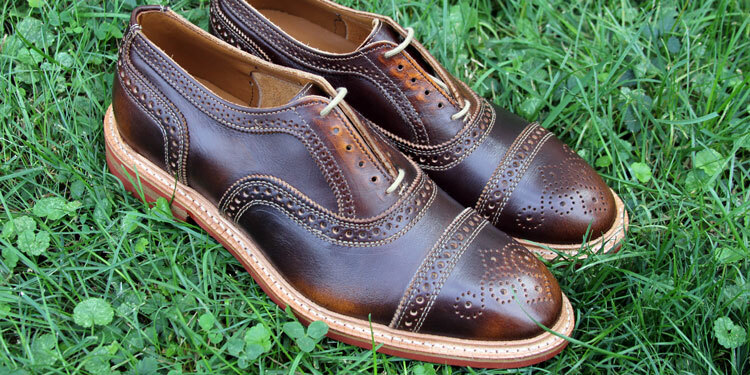 Focusing on dress and dress casual shoes in the mid-to-upper prices ranges (approximately $200-$700 per pair), Allen Edmonds crafts shoes that are intended to last years and years, and they achieve this through an extensive, multi-step construction process that focuses on making shoes with Goodyear welt construction. To this end, they offer fee-based recraft services (see a breakdown of their offerings and a review of their recraft process). Aesthetically, the brand can be categorized as classic with occasional flairs of fashion-forward style, such as brick red Dainite soles. [Allen Edmonds Brick Dainite Sole Shoes] Finally, Allen Edmonds is unique in that they offer a wide range of sizes and widths that many other brands don’t. This is a great brand to shop for those of us with particularly large, small, narrow, or wide feet. 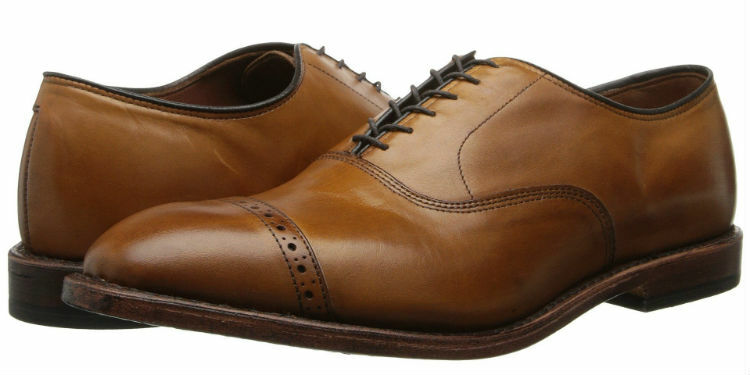 The Park Avenue cap-toe oxford has been Allen Edmonds’ best-selling shoe for more than thirty years. A timeless business professional classic, it’s been worn by high-powered men for years, even heads of state. Due to the high demand for this shoe, it’s made in many sizes and widths, colors, and is recraftable. For a man looking to add to his capsule wardrobe, you simply cannot go wrong with this shoe in black or brown. The Strandmok Cap-Toe Oxford is the perfect vintage style dress shoe for the modern man. The newly designed Strandmok by Allen Edmonds features all of the classic elements of the Strand shoe, but has added functionality with a studded Dainite rubber sole and Poron insole for more comfort. 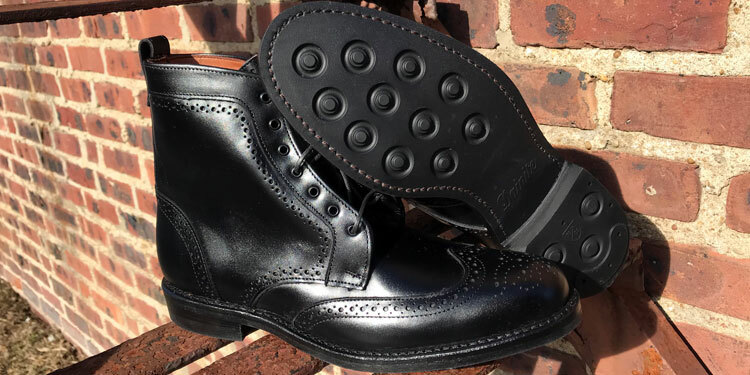 The Sullivan Street Boot is one of several options in Allen Edmonds’ line of stylish men’s dress boots. 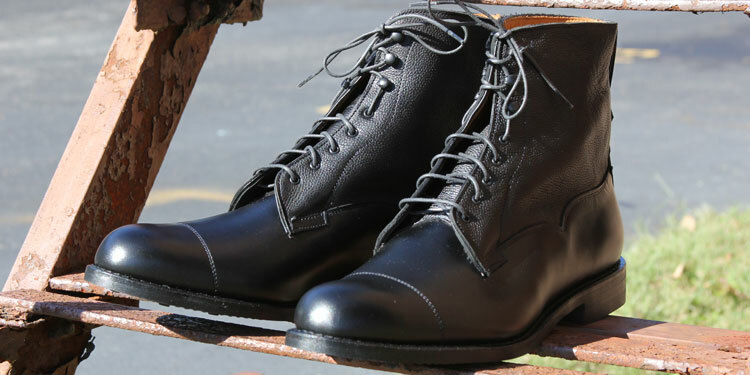 These dress boots are particularly functional as they feature a Dainite rubber sole for performance in the most inclement of weather conditions. Furthermore, the mixed leather materials on the upper (smooth calfskin leather and full grain leather) combine for a truly unique and versatile shoe. The Addison Penny Loafer by Allen Edmonds is everything you want in a casual loafer. A classic penny loafer design featuring Chromexcel leather with a Dainite rubber sole for added functionality and performance in all weather conditions. If you’re looking for a gorgeous, well-constructed blucher boot, look no further than the Dalton. Made with both Dainite and leather soles with an open-throat lacing system, the calf-high Dalton boot can kick a pair of jeans up to the next level while pairing beautifully with a suit in chilly weather. 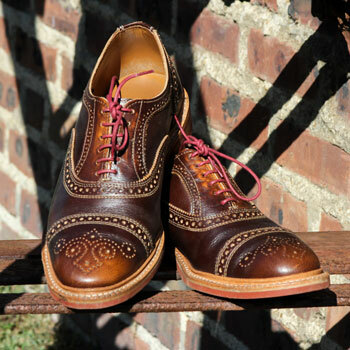 Its wingtip detailing and handsome perforations add visual interest that separate this boot from others in its class. The Dalton is also available in a cordovan leather for those whose budget allows. A full brogue with closed throat lacing, the McAllister is another member of the Timeless Classics Collection by Allen Edmonds. Another recraftable shoe made in a dizzying array of colors, sizes, and widths, this shoe works just as well with jeans and a sport coat as it does with a suit. The Strand is a classic-yet-contemporary semi-brogue with oxford-style closed throat lacing. An incredibly versatile shoe with some truly gorgeous perforations, it can be dressed down with a pair of jeans, paired with your favorite slacks for a business casual dress code, or dressed up with a suit. This shoe is available in a wide array of colors from black to oxblood to navy. As it’s one of Allen Edmonds’ classic styles, it’s stocked in a huge range of sizes and widths. As is the case with man Allen Edmonds shoes, they’re also recraftable. The Fifth Avenue is yet another one of Allen Edmonds’ best-selling shoes. This cap-toe oxford features an elegant design as well as premium calfskin leather that combine for a sleek and professional look that will be sure to turn heads. Where Can You Buy Allen Edmonds Shoes? Allen Edmonds shoes are sold online as well as at physical retail locations throughout the United States. Allen Edmonds owns and operates 65 retail locations in the United States and their shoes are also available in select department stores, such as Macy’s and Nordstrom. First and foremost, there’s Allen Edmonds’ official website. They’ll always have the most up-to-date styles and sizing, and you can also view the rest of their product line quickly and easily. Additionally, Allen Edmonds shoes can be found on reputable online retailers like Zappos.com. Allen Edmonds has a section of their website called “factory seconds,” and it is absolutely the best-kept secret on the Internet. The only difference between factory seconds and “first quality” shoes is that factory seconds have slight cosmetic blemishes and Allen Edmonds won’t sell them for full price. This in and of itself is a wonderful testament to Allen Edmonds’ commitment to quality. The benefit for us as customers? Compelling discounts on shoes that no one would ever think were in any way imperfect. This is great for any man just starting to build his wardrobe and / or who’s looking for some Allen Edmonds product on sale. Note that there’s a $25 restocking fee for any Allen Edmonds seconds returns, and sizing and colors are understandably not consistent. Click the following link to learn more about Allen Edmonds Factory Seconds. Another way to access factory seconds and other outlet merchandise, the Shoe Bank allows you to easily filter your search by size, width, color preference, last, and more. Exceptional construction: Nearly all of their shoes are made with a Goodyear welt, allowing for longevity and making them a true investment. Comfort & sizing: High-end materials combined with a comprehensive sizing system means that just about any man can find a comfortable shoe that truly fits his foot properly. Sizes range from 6-16, and widths range from AAA (extremely narrow) all the way up through EEE (extra-extra wide). Easy-to-wear aesthetics: The shoes are sartorially classic and tend to not get too “fashion-y.” As such, they’re easily wearable for most men in most situations. Value: The comfort, longevity, and easy ability to recraft the shoes means that every dollar you spend is well worth it. Price: While they’re not the most expensive shoes on the market, Allen Edmonds’ footwear is by no means inexpensive. The incredible value rolled into the price isn’t super helpful if a guy can’t afford them. Aesthetic Conservatism: For a man who prefers a more tapered last or just more general flair to his shoes, Allen Edmonds may not be a good fit, aesthetically speaking. Allen Edmonds offers additional value with many of their shoes insofar as they’re eligible for recrafting. For a full review of the process and the different packages available, take a look at our Allen Edmonds recraft review. We strongly believe that Allen Edmonds makes some of the finest shoes not just in the United States, but the world over. Their commitment to keeping production stateside is impressive, as it demonstrates that quality is top of mind for every one of their employees, from floor salespeople right up through the CEO. That such a move creates and keeps good-paying jobs in the U.S. is admirable to us. We strongly recommend that you buy your first pair of Allen Edmonds shoes if you haven’t already!